I’m beginning to worry about Tony Abbott and how his war on the ABC is affecting him (Photo above by Jeremy Piper, News Corp Australia). I don’t agree with all his policies (too many to mention here), but I’ve considered him a nice bloke since I got to know him in the late 2000s. In fact, I actually posted that compliment about the Prime Minister on my Facebook page last year, and my late mate and former ABC and Nine video editor Steve “Slam” McQueen questioned my criteria for describing Tony as a “nice bloke.” I replied by reminding him how Abbott used to drive his old (1976) Valiant, then his old (1983) Merc (or Rover), to TV studios on a Sunday morning as he believed it was unfair for Commonwealth drivers to have to work on a Sunday. And as an executive producer on the Sky News Sunday Agenda program, I often had great difficulty getting any politician to show up at 9am on Sunday, let alone the then Shadow Aboriginal Affairs Minister. But he would arrive, often at the last minute, as he had to drive from his home in Forestville in Sydney’s north to the Sky studios in Macquarie Park – about 13 kilometres. And on a few occasions, I had to call him or his media adviser on a Saturday when I was still searching for a guest. The only times he said no were understandable: he was a member of the NSW Rural Fire Service brigade in Davidson and on duty. Now that’s what I call a nice bloke. Tony Abbott was interested in Aboriginal affairs and in 2008 he talked about going up to Cape York to tutor Indigenous children on his winter break. He still goes up north for a short break every year. I mentioned I had taught in Harlem in the late sixties and the real heroes were those who stayed behind, like the teachers in Cape York. He’s used that line a few times since, but I don’t mind. He was a decent bloke. In 2011, I was producing Channel Ten’s Meet the Press and we tried all year to get the then Opposition Leader on the program. Ironically, I played “meet and greet” early on Sunday mornings when Tony Abbott came in to do a pre-recorded two-way interview with Andrew Bolt for The Bolt Report in Melbourne. On each occasion we exchanged pleasantries, I got him coffee at the café next door, and after the interview, I would walk him to the car (with a Commonwealth driver, but after all he was a busy Opposition Leader), and ask him when he was coming on Meet the Press. He would yell across the roof of the car to his then press secretary, Andrew Hirst: “Yes, Andrew, we must make a date.” I would thank him, and yes, you guessed it, no date was made that year. Still a decent bloke, but a bit of a prevaricator. Many politicians are. And as a series producer on The Observer Effect on SBS in 2013 presented by Ellen Fanning, I and other staffers tried for nearly six months to get the Opposition Leader (and later Prime Minister) as a guest – to no avail. His schedule was too crowded. Still a decent bloke, but now I’m beginning to wonder. He was also a journalist. I remember him as a university student visiting The Australian to talk to the then features editor, Tim Hewat, about articles he wanted to write. Then he went to The Bulletin and wrote pieces for them before moving on to politics. He often mentions his journalism career fondly, and he has written four books, including his autobiography, Battlelines. And he even read all five books shortlisted for the 1914 Prime Minister’s Literary Award for fiction, though he did upset some of the judges by not telling them before the announcement that he had overruled their decision and selected joint winners: Richard Flanagan’s The Narrow Road to the Deep North, and Steven Carroll’s A World of Other People. They had recommended Carroll’s book. Still a decent bloke. The thanks turned to anger less than two weeks later when Zaky Mallah, who was convicted of threatening to kill ASIO officers, appeared live on the ABC’s Q&A program and asked a question about counter-terrorism measures that upset Parliamentary Secretary Steven Ciobo, who responded by suggesting he’d be happy to see Mallah deprived of his citizenship. It got worse when in a follow-up comment, allowed by host Tony Jones, Mallah said young men in Australia are going to join Islamic State as a result of “ministers” like Ciobo. Jones then had to rule his comment out of order, and it was on for young and old. The ABC apologised and said it was an error in judgment to have Mallah live on the show. The ABC’s Managing Director Mark Scott mounted a free speech argument. No longer praising the ABC, Tony Abbott said “heads should roll” at the broadcaster, and the board said Mallah shouldn’t have been in the audience because of his “criminal background and past public statements.” One of those statements was a misogynistic tweet saying two conservative female journalists should be “gangbanged.” Tony Jones said on the next episode of Q&A Mallah would not have been allowed on the program if the producers had been aware of the tweet. The board gave a formal warning to Q&A Executive Producer Peter McEvoy. 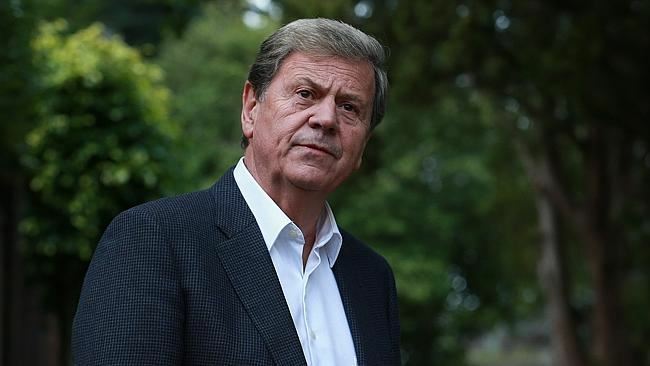 And former SBS chief Shaun Brown and TV journalist, presenter and former ABC correspondent, Ray Martin (photo above by Britta Campion, News Limited), have been asked to review Q&A. I also hope it never happens again and that the Prime Minister tones down his “rants and raves” about the ABC and Q&A. I’d like to remember him as a nice guy.